Thomas, Simon, and Kadiyali (2007) analyzed 27,000 real estate transactions. What did they find? Buyers pay more money when prices are specific (e.g., $362,978 vs. $350,000). 4) Have an Anchor price- Always start with high price- you’ll never know what your net can catch if you cast it far. Put a high price tag, then customer will tell you that you’re out of your mind and that the product doesn’t worth more than X. That X might be much higher than your avg. deal price. Due to anchoring, it’s no shocker that sellers can get more money by starting negotiations with a high initial offer (Galinsky & Mussweiler, 2001). That high number establishes an anchor point, pulling the final settlement closer to that range. Not only should you start with a high initial price, but you should also use a precise value. In one study, Janiszewski and Uy (2008) asked participants to estimate the actual price of a plasma TV based on the suggested retail price — either $4,998, $5,000, or $5,012. 6) Visually Distinguish Higher Price Comparisons When you compare your price to a higher price, people are more likely to buy your product because they feel less motivated to research the decision (Urbany, Bearden, & Weilbaker, 1988). They’ve already done their homework. But here’s a neat psychological trick to enhance that comparison. How can we convince the client (without telling him) in psychological way to choose the later rather the former? Simple, we add another anchor, a 3rd option that will “help” them to decide. However, the “print only” option helped people compare those two options. Because it was a similar, yet worse, version of the “web and print” option, people could easily recognize the value of the web and print subscription. 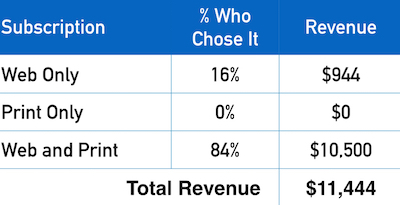 With more people choosing “web and print” (a more expensive alternative), the Economist generated 43% more revenue. 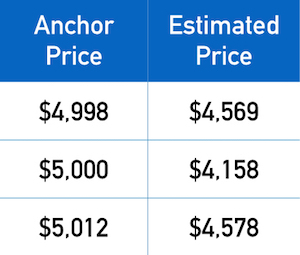 Anchoring not only works for prices, but it also works for any number, regardless whether that number is a price. Here’s a striking example. Ariely, Loewenstein, and Prelec (2003) showed participants various products (e.g., cordless keyboard, rare wine, Belgian chocolates). 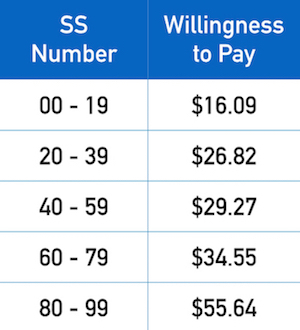 They asked participants whether they would purchase each product at the dollar amount equal to the last two digits in their social security number. After receiving a YES/NO answer, researchers then asked participants to state the exact dollar amount they would be willing to pay. How can you apply that finding? Should you simply ask customers to contemplate a high number? Not quite. Luckily, your job is easier. Anchoring effects occur subconsciously, so consumers don’t need to contemplate a numerical anchor. In fact, Adaval and Monroe (2002) subliminally exposed people to a high number before displaying a price. That exposure caused people to perceive the subsequent price to be lower. The takeaway? Even if potential customers don’t consciously notice your numerical anchor, they just need to be exposed to it. When people generate their reference price, that high number will trigger an anchoring effect (and their reference price will be even higher). When describing your product, avoid mentioning any references to money. Instead, mention a concept that has a much greater benefit: time. To avoid the negative perception of discounts, you might want to avoid the term “discount.” At the very least, you should give a specific reason for the discount. The easiest way to control price perception is through the just noticeable difference (JND). You can also, raise the Price of Your Previous Product If you’re launching a new (more expensive) version of your product, how should you price the old product? Some businesses will lower the price of their old product to gradually phase it out of the market. Surprisingly, though, that strategy is often the wrong approach.